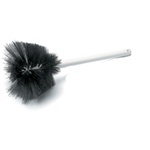 We carry a wide variety of cleaning brushes for scrubbing and rubbing away dirt and grime. Our utiility brushes from rubbermaid, carlisle, and zephyr are top of the line and durable for many months and years of use. The counter brushes from rubbermaid and zephyr are great for brushing and scrubbing counters and other materials. Carlisle Coffee Urn Guage Brushes 24 in. 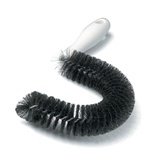 Carlisle Coffee Urn Nylon Brushes 16 in. Carlisle Triple Glass Washer Brushes 8 in. Carlisle Bottle Carafe Brush 12 in. Carlisle Potato Brush White 5.75 in. Oven Brush Brass Bristles And Steel Scraper - 10 in. Tile and Grout Black Brush - 8.5 in. 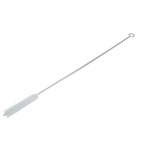 Broiler Brush - 17 in. 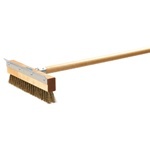 Wholesale utility and counter brushes to brush away the dirt in your foodservice establishment. Carlisle makes more foodservice type brushes for basting and pastries. And don't forget about our toilet bowl brushes to keep your bathrooms sanitary. The restaurant supply experts stock all of your cleaning brushes as well to clean your restaurant business or home.